The Justice Department confirmed to multiple news outlets that Attorney General Jeff Sessions was interviewed in mid-January for the Russia probe. 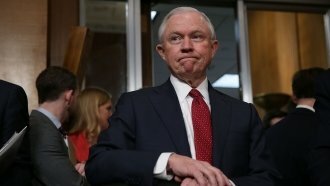 We now know Attorney General Jeff Sessions was questioned last week about Russia's interference in the 2016 U.S. presidential election. The Justice Department confirmed Sessions was interviewed with multiple news outlets. Special counsel Robert Mueller's team reportedly questioned the attorney general for several hours. This marks the first time we know of that Mueller's team interviewed a current member of President Donald Trump's Cabinet. Last year, Trump had the White House's top lawyer pressure Sessions to stay a part of the Russia investigation. But Sessions recused himself from the probe.